Although not classified as an official sub region, the Bellarine Peninsula however is an integral extension of the Geelong Wine Region. It is a little known fact that the Geelong region was one of the first in Australia to produce wine. There were 225 hectares under vine in 1861. Within 10 years however, the total was 400 hectares. Unfortunately the discovery of the vine louse Phylloxera caused the Government of the day to order the eradication of all the vines in the Geelong district. As it can be difficult to grow grapes in the region consistently, it was not until the 1990’s that the industry slowly re-established. As always however, there are exceptions. Bannockburn Vineyards were established in 1974. Austin’s and Scotchman’s Hill followed in 1982. The Geelong region is now recognised as producing some of the finest cool climate boutique wines in Australia. With good reason, Pinot Noir is the main grape planted – and can thrive in the cool conditions, producing wonderfully complex wines. Shiraz is the next most grown grape, and often displays the lovely peppery notes that are the hallmark of cool climate Shiraz. Chardonnay is the next most import grape, showing complexity and ageing ability. The region also lends itself to age worthy, multi layered Chardonnay, matured in high quality French Oak. Oakdene – Situated in Wallington on the Bellarine Peninsula. Oakdene offers a generously appointed, if somewhat quirky cellar door. On site is a cafe for informal dining, and award winning restaurant. The wine focus is on sparkling wine, Chardonnay, Pinot Gris, Sauvignon Blanc, Pinot Noir and Shiraz. The wines are complex and elegant, reflective of the true varietal character of region. Terindah Estate – Situated in Bellarine, the cellar door is bright and spacious, highlighting the magnificent surrounding views. The cellar door team are friendly and knowledgeable. Most importantly, the wines are very good. The usual cool climate varieties of Pinot Gris, Chardonnay, Pinot Noir and Shiraz are are on offer, as well as a few interesting curios. A wine made from a rare and fussy grape from Northern Italy called Picolit is offered for tasting. The other left of field offering is the hugely popular grape grown in California known as Zinfandel. Interestingly, this grape has recently been identified as the same grape grown in Italy kmown as Primativo. Further to the Cellar Door tasting, Terhindah offers a wonderful panoramic dining experience in their restaurant aptly named‘The Shed’. Jack Rabbit Vineyard – This vineyard and restaurant precinct is dedicated to the indulgence of the senses. Breathtaking views of Port Philip Bay – with the occasional glimpse of a distant Melbourne CBD. Sometimes it is best to enjoy such things from afar. In 2015, Jack Rabbit was awarded ‘ Best People Place and Tourism Restaurant in Australia ‘ at the prestigious Savour Australia Restaurant and Catering Association National Awards of Excellence. There is lovely food, there is lovely wine and people – what’s not to like? 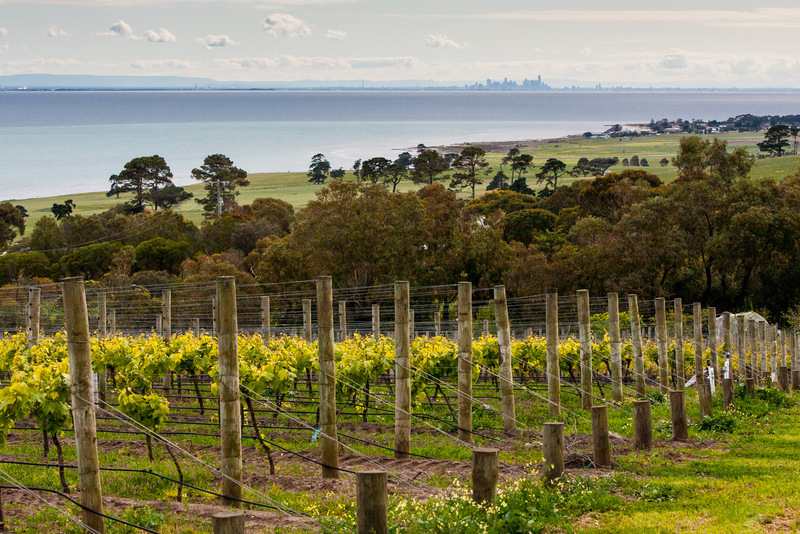 Scotchman’s Hill – Situated at Drysdale on the Bellarine Peninsula, this winery is one of the oldest and biggest producers of wine in the Geelong Region. Long time wine maker Robin Brockett has continued to deliver high quality cool climate wines over many years. The main focus of the winery is Chardonnay, Pinot Noir, and arguably their best wine, cool climate Shiraz. The cellar door, restaurant and outdoor terrace is so welcoming and visually appealing, that you could easily spend the entire day here. Or two. Other wineries & attractions include.